Purchased by the father of the present owner in May 1942 at which time it was said to have come from Pavlovsk Palace. Another table, identical but the top inlaid with cards, is discussed J.M. Greber, Abraham and David Roentgen, Möbel für Europa, Starnberg, 1980, vol. I, p. 235, and illustrated vol. II, p. 319, fig. 637. Sold at Sotheby's London, 17 April, 1964, lot 116 ($22,960 to Niarchos) it was said to come from the Cairon Collection, and have been in the celebrated Stroganoff Collection, Leningrad before being sold by the Soviet government in Berlin in 1931. When purchased in 1942, it was claimed that this table came from Pavlovsk Palace, the famous palace near St. Petersburg built by Paul I and Maria Feodorovna. In the absence of any inventory numbers, it has not been possible to substantiate this claim. However, Roentgen was very active in Russia. He visited St. Petersburg five times between 1783 and 1789, exactly the period within which this table would have been made. Catherine the Great made her first purchases from him in 1783 and even sent her grandsons Alexander (Paul I's son and future Alexander I) and Constantine to be trained in Roentgen's workshop. In 1786, she placed an order for fifty pieces mainly in mahogany but also some pieces in satinwood. Paul and Maria Feodorovna met Roentgen on August 18, 1782 at Montbéliard and a number of pieces by him were delivered to Pavlovsk in 1786 including a satinwood dressing table now in Paul's dressing room. David Roëntgen (1743-1807), born in Neuwied and son of the great cabinetmaker Abraham Roentgen, was one of the greatest cabinet-makers of the age. Famed for the quality of his workmanship and in particular his skill in mechanical furniture, he first went to Paris in 1784, becoming ébéniste mécanicien du Roi et de la Reine in 1785. The ormolu mounts on this table are most probably by the bronzier Francois Rémond, who supplied Roentgen with his mounts after 1780. 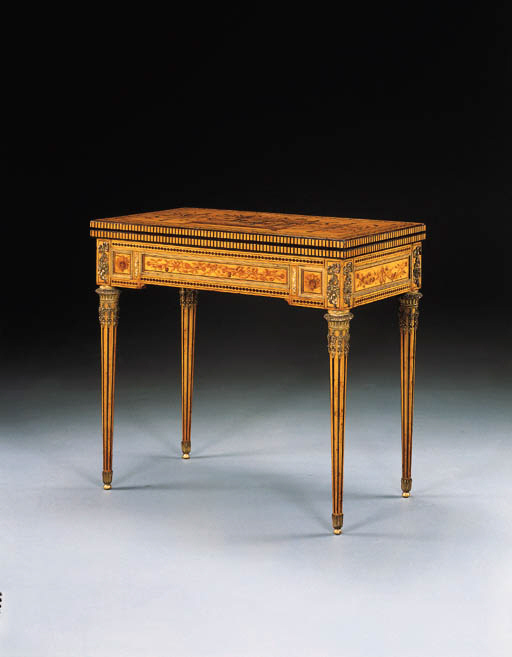 A Louis XVI tric-trac table of exactly this form with the same mounts was sold Palais Galliéra, Paris, 19 March, 1966, lot 97. Interestingly although the shape is the same, the marquetry is quite unlike Roentgen's and the table is stamped by Pioniez (died 1790) (see P. Kjellberg, Le Mobilier Français du XVIIIe Siècle, Paris, 1989, p. 658). Said to have belonged to Marie Antoinette, it sold for 206,000 francs.